I recommended the photo for this week's Sepia Saturday prompt. 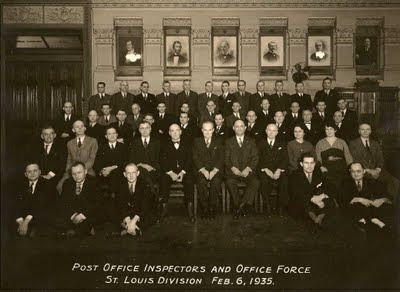 It comes from the Harry Truman Library - and I found it browsing through the Missouri Digital Heritage website. It's an unusual group photo. 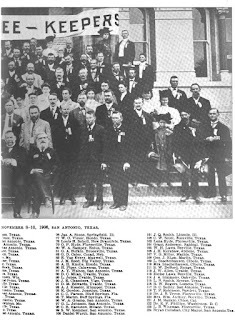 Most group photos are from the front, but here we get to see everyone's backs, as they pose for a more traditional photograph in front of the press. The photograph was taken on July 17, 1945, the day after the atom bomb was tested in New Mexico. Truman had written on the back of the photograph, "This is the place I told Stalin about the Atom bomb, which was exploded July 16, 1945 in New Mexico. He didn't realize what I was talking about! HST"
I've shared a few large group photos here in the past. This group photo of the St. Louis Post Office Inspectors and Office Force from 1935 came with a caption identifying everyone, which I transcribed here. Both of my maternal grandparents are in the photo. This photograph, unfortunately, had no such caption. 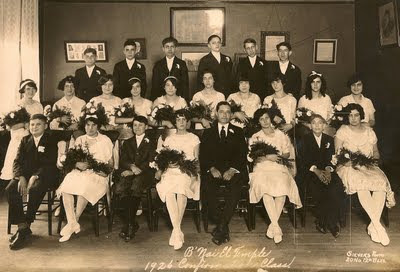 It's the 1924 Confirmation Class for B'nai El Temple. The youth in the front row, second from the right, with a thin white box drawn around him is my paternal grandfather, Melvin Newmark, age 12. Here, however, is a photograph I haven't shared. 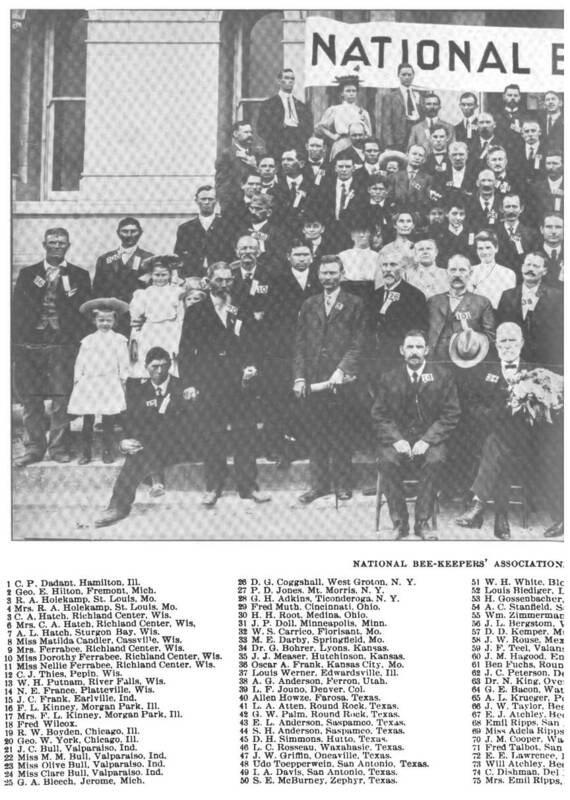 The National Beekeepers Association meeting from 1906. I found this in Gleanings in Bee Culture, Volume 35, 1907, pp. 34-35. The images can be enlarged, or one can follow the link for an ever larger look. Everyone was given a piece of paper with a number on it to hold, and the caption below identifies everyone by number. Unfortunately, #83, "E. Van Every," didn't make certain the piece of paper was visible to the camera, so I am uncertain who showed up to represent the Van Every family. Either the caption is in error, and it should read "M.E. Van Every" for my great grandfather, Melvin Elijah. 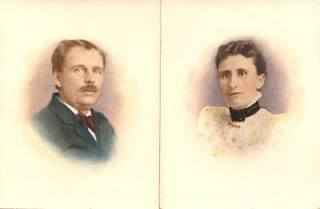 Or his fourteen year old daughter, Evelyn/Evva, represented the family. There are some young women in the photo, so it's possible. I've sent the photograph to some cousins, but haven't yet received any positive or negative identification. I do have a photograph of Melvin, shown below with his wife, Margaret. I don't see a clear match for him in the group above. Apart from some sports' teams my family appears to have avoided group photos, I prefer your other groups to the Potsam picture. What a clever idea, giving everyone a number to aid indentification. Imagine if everyone had done that; it would have made identifying family members in large groups a lot easier. How frustrating, to have a photo of a family member, but not know which one it is, or even which individual in the group. I have encountered similar difficulties with my own family photographs, usually solved by careful comparison with other contemporary photos. I like your group photos. 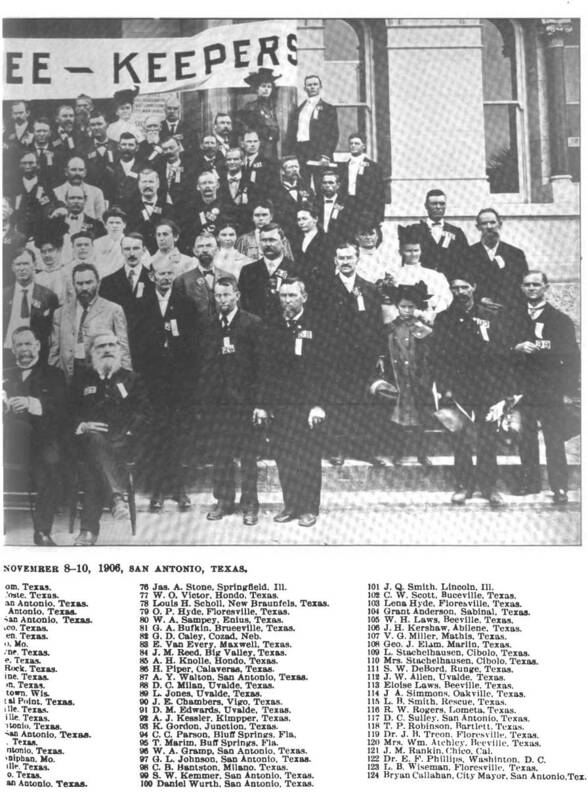 I would love to see a theme on group photos some time. Groups in old family photographs always cause me problems - which particular head should I be focussing on. Thanks for the theme image - it seems to be sorting out the men from the boys. At first glance, it looks like everyone is perfectly posed in the first two pictures. Then when you look closer, you can see variations and some who are not paying attention. Too bad no one thought to wear a number in all those school, church, and Sunday School photos I have from eons past. It's so funny I still hold the number I was issued in 6th grade! We started a new team teaching program with 105 students all in one class, and they'd break us down in smaller groups for some classes to better prepare us for junior high. My # was 21 with my last name being in the C's, I was up pretty close to the top! But the number thing worked for everything so much easier than names! There are always a few recalcitrant in a group photo, and they don't realize the headaches they'll cause later for genealogists. I had such a group picture of my grandpa and it took me a while to find out which one he was. It's a good pic, involving a train.